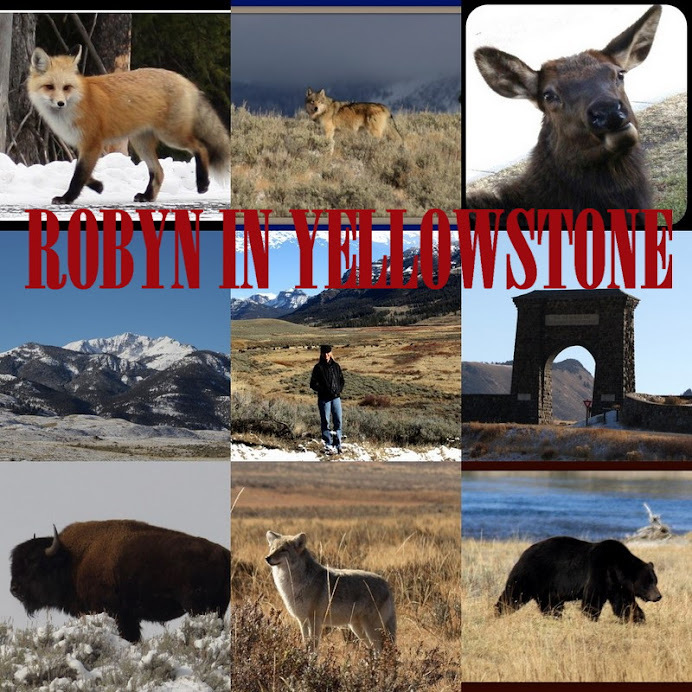 This is my 300th post of Robyn in Yellowstone and I am 2300 miles away from Yellowstone. I am wearing a nice pair of wool socks with a bison on them with the word Yellowstone so I still have a part of Yellowstone with me. These warm socks are coming in handy as I have just experienced a huge blizzard that shut down all of New York City. And this 'ol Minnesota and Yellowstone gal is in awe of this storm. I have never experienced anything quite like it. With some areas getting up to 30 inches and winds topping 60 mph in some places it really socked NYC. It was the drifting that I found incredible. The 3 feet of snow that hit Mammoth on Thankgiving doesn't compare to what I've seen in this urban blizzard. It's crazy. The holidays are great time to get away. Many people make plans to spend the time in Yellowstone. With snow, snowmobiling, beautiful Christmas Trees (outside the Admin Building and in the Map Room at the Mammoth Hotel), cross country skiing, snowshoeing, etc. there is plenty of ways to celebrate the holidays here. But I will not be here taking part in those festivities. I will be leaving Saturday morning to celebrate Christmas and ring in the New Year in New York City! It will be my first visit there and I have a list of fun adventures that I will be partaking in (riding the subway, the Staten Island Ferry, Museum of Natural History, Time Square, Central Park). Patrick grew up on Staten Island and asked me to accompany there for the holidays where I will meet his very New York, very Italian and very large family. A small-town Minnesota gal in the big city ---- I'm sure a great comedic holiday film could be made of this. This past week was a week of snow flurries with peaks of sun. But mostly it was gray week. It has been warming up and today is a slushy day. The numerous icicles are beginning to fall off the buildings and we can hear the sounds of steady drips from the roof. But there is plenty of snow on the ground from the storm a couple weeks ago. My weekend included a trip to Bozeman (according to Andrea that is a trip to civilization). It has been awhile since I had been there so it was a welcome change of scenery. Once again I had a 'famous last words' moment. Patrick spends most of his time in the southern part of the Park so he went with me on one of my Lamar trips. While driving past Floating Island Lake yesterday I mentioned that area was a good place to spot moose when suddenly we saw a grand bull moose. By the Yellowstone Picnic Area we saw a couple big horn ewes pawing at the snow to uncover the grass. Coming back into Mammoth we noticed that the sky was a brilliant display of colors: bright blue, pink, white and yellow. On Saturday I took my first winter trip through Lamar Valley. It has been quite a few months since I've made my way there and I was excited for my first drive through the valley. It had snowed over night and there was about 2 inches of new snow covering it. Occasionally I would see some tracks meandering through the snow. There were quite a few elk in Lamar but there was a lack of bison. I saw a few lone bison and a few pairs but no large herds. A snowy Soda Butte and mountains were a spectacular sight. I looked for bighorn sheep across from the hitching posts since they seemed to be regulars there last winter. I didn't see any sheep but I noticed that one of the rocks at the top had ears. Curled up in a ball was a sleeping coyote, soaking in the warmth of the sun since it was only 6 degrees. It would occasionally raise its head and twitch its ears. It was the only coyote that I saw in Lamar that day. The 24 hour notice for interior roads to be closed was given at 12:00 pm on Friday. That gave anyone in the interior 24 hours to move their vehicles out. This was scheduled to take place December 15 but there has been so much snow lately that it happened 1 1/2 weeks early. So Patrick made it to Mammoth this weekend via a snowmobile. Last night we made a stop at the Food Farm in Gardiner and on our way back up the hill to Mammoth we came upon a bobcat running around on the road. It leaped over the guardrail and stopped to watch us. This was my first bobcat sighting in the Park. A little further up the road we came upon a snowshoe hare racing around and even further there was a coyote running on the road. We had to stop at the Yak Camp and as I sat in the vehicle with my headlights on a beautiful little fox came into view. It stopped, sat down and yawned right in front of my car and eventually trotted by my car and down the road. All this wildlife in the matter of 5 minutes. Bison by Fishing Bridge Jct. Life is full of famous last words. My famous last words were: "reliable internet". And of course when someone utters some profound statement life comes along and proves you wrong. I have a bunch of great pictures I have been trying to upload and I keep losing my 'reliable' internet connection and I have to start over again. Since I like to think of my pictures as a storyboard to along with a narrative I certainly like to include some semi-interesting pictures to go along with what I'm talking about. Unfortunately, I can only load one picture, a picture that would be smack in the middle of my story. Anyway, here goes my story (which would be so much more semi-interesting with some pictures). Patrick had to move his work vehicle and his personal vehicle up to Mammoth for the winter. His next exit out of Lake will be on a snowmobile. He needed to get back to Lake so we took my vehicle to drop him off. So I grabbed my camera and we were off. My famous last words for today were: "I've never seen moose in Willow Park." The words weren't out of my mouth 10 seconds when Patrick says, "There is a moose." This is an area where I don't mind having the opposite of what I say happen. Sure enough there was a moose. And after looking closer it turned out to be a cow and a young bull. This is where, with your minds eye, you can insert an award winning photograph of 2 moose taken by yours truly. In reality you would see a post of an average picture of 2 moose. Thrilling none the less. We watched a couple bison and a mousing coyote by Gibbon River. I waited for the pounce but gave up after getting a cramp in my arm holding my camera to my eye as I waited in anticipation. He cocked his head back and forth for awhile and instead of pouncing he just stuck his head in the snow repeatedly. Our next thrill was making it up Blanding Hill (east of Norris). I usually have a sigh of relief when getting to the top, and I sigh twice when coming down safely. We got quite a treat in Hayden Valley. We were watching the swans in the Yellowstone River when a coyote came trotting down the opposite side. He finally ran after a few swans that were near the edge, kind of a half hearted attempt. A couple swans sat a few yards from the edge tempting fate as the coyote watched them. It was interesting to watch and fun to listen to. The swans really put up a ruckus as the coyote watched them. There were quite a few bison in Hayden Valley, and a few on the road by Fishing Bridge Jct. on my return. I followed a couple galloping bison past Obsidian Cliff but my return to Mammoth was much less eventful. I tried out a couple famous last word statements: "I've never seen a mountain lion." "I've never seen a mountain goat." I guess famous last words only work if there is someone else to hear them because as of yet I have not seen a mountain lion or a mountain goat. I'm looking at about 3 feet of snow in Mammoth now. It just keeps coming. But a good dumping of snow cannot stop a Taco Tuesday from commencing. After a feast of tacos most of the NPS employees were sent home, except for a few essential employees such as rangers and snow plow drivers. Betty and Judy were unable to make it to work today so it was only Andrea and myself. With a lack of people moving through the Park it wasn't all that difficult for the two of us. Quite a few NPS employees braved the snow and wind to come for tacos but once that was over we closed the store once again. Andrea and I will open up tomorrow for NPS employees who will be in Mammoth but we are not expecting much activity. The Gardiner school closed early and had to follow a snowplow up the canyon to the Park to drop off their precious cargo. The only people in the Park at this time are the NPS employees who live here, a few Xanterra emplyees and 3 YGS employees. It's very silent outside except for the sound of the wind and the snowplows as they come dragging their plows by. Interior roads were closed to Admin travel. This ex-Minnesotan is loving it but Alabama Andrea has had enough. Thank goodness she keeps getting her car stuck because I'm sure she would be driving off to Alabama with all this snow in her rear view mirror. This is for my friend Linda, whom I worked with at Canyon General Store in 2009. She is a wonderful woman who has a new title: Cancer Free!!!!!!! I am so happy for you and I look forward to your next excursion to Yellowstone National Park. Next time you will not only get a high-five but a huge hug!